The Business Vitality Initiative process and the content in this toolkit were developed by and remain the intellectual property of the Centre for Innovative and Entrepreneurial Leadership (CIEL). Through a dynamic partnership between CIEL and the Community Economic Development and Employability Corporation (CEDEC), this bilingual community handbook is a tool which will be used to enhance business vitality in Quebec and provide opportunity for the English-speaking and broader community to work together. In February-March 2010, CEDEC successfully led a pilot of the Business Vitality Initiative in Campbell’s Bay, Quebec, and facilitators have been trained to conduct the BVI in communities that have demonstrated their readiness for this process. A BVI Facilitator's Guide accompanies the Community Handbook. "Do young adults (25-34) find this community attractive? Do we have a businessfriendly council? Do business and education communities work together to provide timely, convenient training?" If you’re not asking these questions, it’s unlikely you’re maximizing the potential of your community. Communities identifying their strengths, their gaps and their unexplored opportunities — that is what’s behind the BVI, a measurement and action process that helps communities harness their business potential. It has been designed to help communities assess their capacity to work with and support entrepreneurs, and to foster business growth. The BVI has been employed in communities across Canada (and recently in Australia) by a team based in Nelson, BC. The CIEL/BVI Team has been nominated for BC’s top award in community economic development and most recently won an award as the region’s most innovative organization. 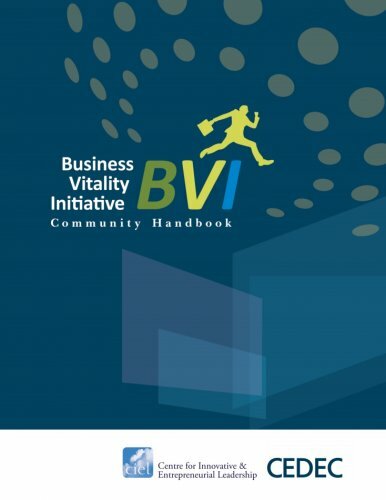 The BVI measures the perceptions of community leaders, business people and citizens about the current business environment in the community and compares the scores to those from other communities using a unique graphical index (the Business Vitality Index). What can I expect from the BVI? Why would our community want to improve its business vitality? What influences the business health of a community?